GOLD 4 GALLICO pellet is a complete feed for laying hens from week 18 and during the entire egg-laying period. This laying pellet contains all the ingredients, minerals and vitamins necessary for a regular lay and a strong eggshell. 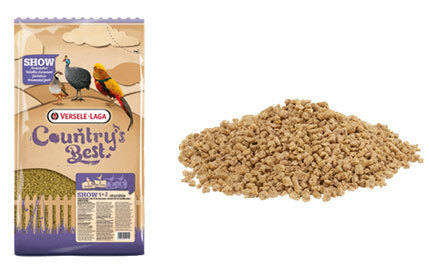 GRA-MIX CHICK AND QUAIL GRAIN MIXTURE is a high-quality grain mixture for chicks and quail. 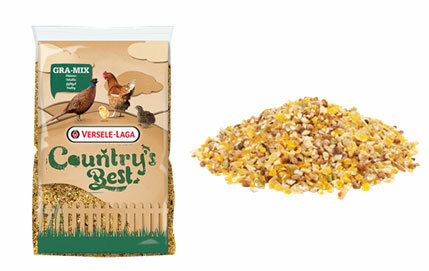 This mixture consists of a variation of grains, seeds and very finely broken maize. 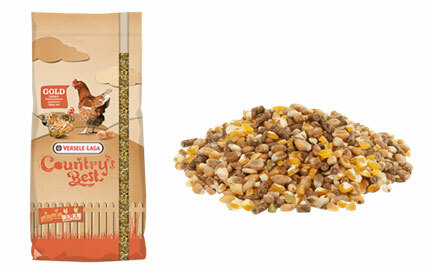 Thanks to the extra fine ingredients in this mixture, the feed can easily be ingested by chicks and quail. 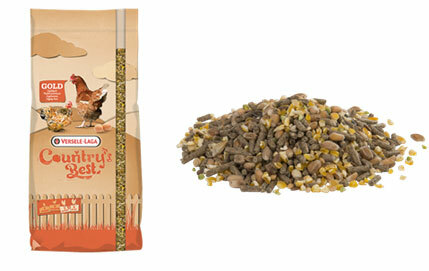 The GRA-MIX mixtures are complementary feeds and are administered best in rations. To keep optimal health, we recommend that you supplement grain mixtures with a complete feed from the COUNTRY'S BEST range. 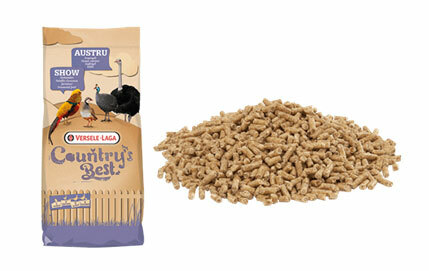 SHOW 3 pellet is a complete feed for pheasants, partridges, guinea fowl, quail and ornamental fowl. Appropriate from the age of 13 weeks and for adult animals outside the breeding season. This feed is recommended for show birds. This maintenance pellet contains all the nutrients to keep the animals in optimum condition outside the breeding season. Omega-3 fatty acids and natural pigments contribute to optimal feather colouring and shiny plumage. 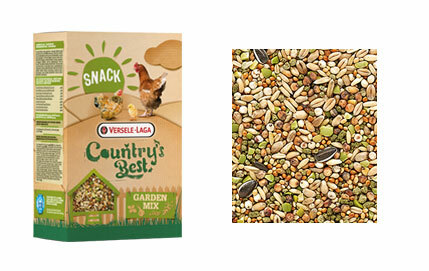 Treat your chickens and ornamental fowls to a delicious "Country’s Best Snack Garden Mix", a varied, high quality grain mixture enriched with herbal pellets. Chickens just love it! Moreover, the herbs such as oregano, thyme, garlic and mint support overall health, immunity and intestinal flora of your beloved animal. 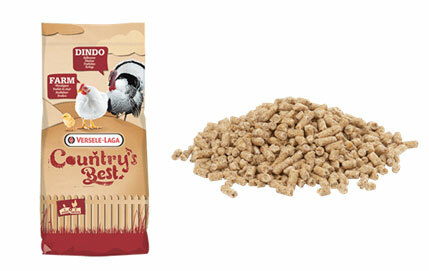 This tasty snack adds variety to the menu and makes your chickens tame. 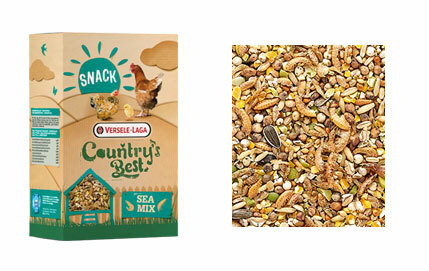 Treat your chickens and ornamental fowl to a delicious "Country’s Best Snack Sea Mix", a high quality grain mixture enriched with prawns and gammarus. It is also an excellent addition to the daily need for animal protein they often find in insects or worms. FARM 2 mash is a complete growth feed for white-fleshed broilers from 11 days until 5 days prior to slaughter. This perfectly balanced mash guarantees a rapid and balanced growth and weight gain. This feed contains only white wheat and other white cereals, so the meat would have a light colour. The mash form promotes a gradual intake of the feed, an improved digestion thus better manure consistency. The coccidiostat protects the animals against coccidiosis. FARM 2 pellet is a complete growth feed for white-fleshed broilers from 11 days until 5 days prior to slaughter. 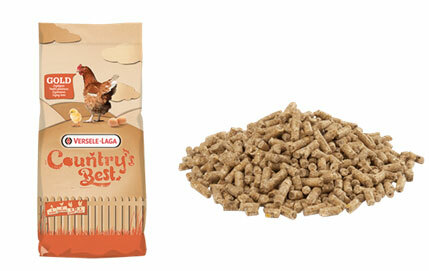 This perfectly balanced pellet guarantees a rapid and balanced growth and weight gain. 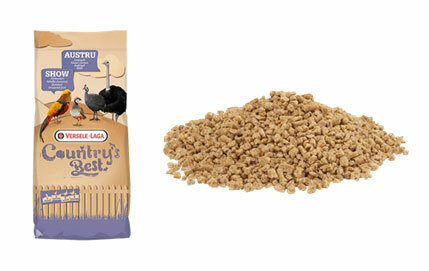 This feed contains only white wheat and other white cereals, so the meat would have a light colour. The pellet promotes a smooth intake without excessive spilling. The coccidiostat protects the animals against coccidiosis. 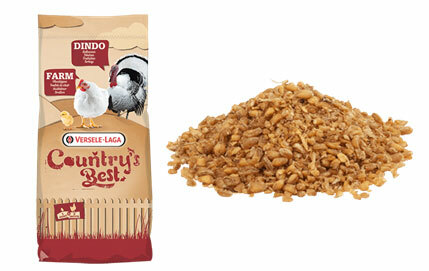 DINDO 2.2 pellet is a complete growth feed for fattening turkeys from week 9 until week 12. This perfectly balanced pellet is the ideal feed for a rapid but balanced growth with a reduced risk of deformations or infections. 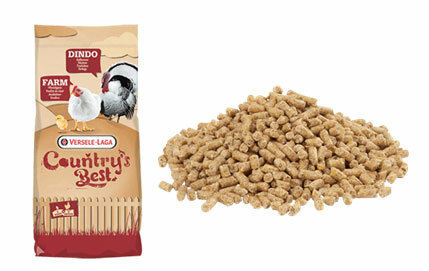 This feed also ensures that the young animals will grow into strong, healthy turkeys. The pellet promotes a smooth intake without excessive spilling. As turkeys are very prone to contract coccidiosis, this feed contains preventively a coccidiostat. The added herbs and plants help to control the risk of parasites. SHOW 2 pellet is a complete growth feed for pheasants, partridges, guinea fowl, quail and ornamental fowl. Appropriate for growing animals from the age of 7 weeks until 12 weeks. 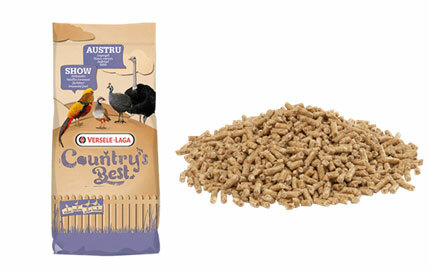 This growth pellet contains all the necessary nutrients for a balanced growth and a perfect feather development. The extra small pellet of 2 mm guarantees a smooth intake. The coccidiostat protects the animals against coccidiosis. 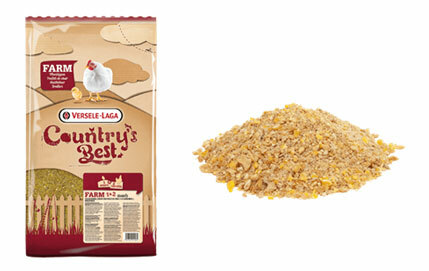 FARM 1&2 mash is a complete starting & growth feed for broilers from the first day up until 5 days prior to slaughter. This perfectly balanced meal guarantees a rapid and balanced growth and weight gain. 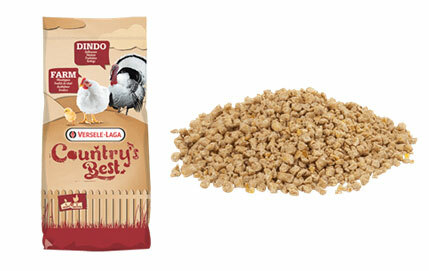 DINDO 1 crumble is a complete starting feed for chicks of turkeys for the first 3 weeks. This perfectly balanced crumble is very rich in proteins and allows the young turkeys to get off to a good start. Small turkeys cannot ingest large-sized pellets and need to be fed on crumbs for the first 3 weeks at least. As young turkeys are very prone to contract coccidiosis, this feed contains preventively a coccidiostat. The added herbs and plants help to control the risk of parasites. SHOW 1&2 crumble is a complete starting and growth feed for chicks of pheasants, partridges, guinea fowl, quail and ornamental fowl. Appropriate for chicks from the first day until the young animals are fully grown. This starting and growth crumble contains enough protein, energy, minerals and vitamins for a good and efficient growth and development. The crumble form promotes a smooth intake without excessive spilling and it is ideal for both the larger and the smaller species. The coccidiostat protects the animals against coccidiosis. 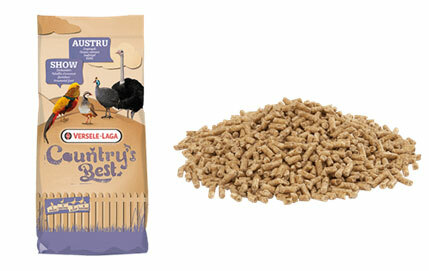 SHOW 1 crumble is a complete starting feed for chicks of pheasants, partridges, guinea fowl, quail and ornamental fowl. Appropriate for chicks from the first day until the age of 6 weeks. This starting crumble contains enough protein, energy, minerals and vitamins for a good and efficient starting growth.